449 McRae Place gets the final touches on the landscaping. Another happy client moving in ahead of schedule!!!! 714 Westridge Qualicum Beach SOLD!!! 714 Westridge Qualicum Beach SOLD!!! 1800 square foot home with a legal garden suite. The new home at Parkside, Qualicum is ready to pour!! 449 McRae is ready to pour!! This 2400 square foot home is located in Parkside. Qualicum Beach. 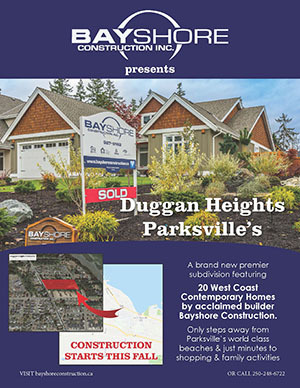 Come check out our show home, open daily. A completed outdoor living area on this Bayshore home. A scale of 1-10 how important is an outdoor living space to you in a new home? Bayshore home it shows white cabinets with an oak island and granite tops. The early reviews are fantastic!! !.